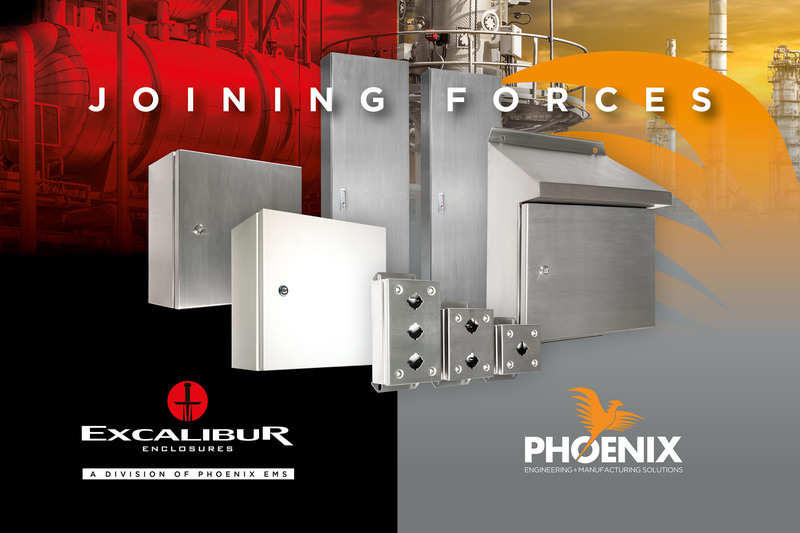 Phoenix Engineering & Manufacturing Solutions announces the recent acquisition of Excalibur Enclosures Brand as a new subsidiary. As we welcome the Excalibur Brand into the Phoenix EMS group of companies, the combination of Excalibur & Phoenix EMS Enclosure solutions significantly contributes towards our expanding product portfolio and market share. This allows the group to provide a more focused and capable experience for our customers. Moving forward the Excalibur brand will be prominent and used to expand and market our range of electrical enclosure products and offering within our always expanding product range and market segments. This additional logo will position Excalibur as a sub-brand under the Phoenix EMS umbrella to ensure we receive maximum exposure. Existing Excalibur Enclosures customers will receive streamlined operations from a dedicated enclosure company, higher levels of customer service, response times, stock availability, technical and engineering support from the dedicated team at Phoenix EMS and our National Distribution partner Colterlec. For further information regarding this acquisition feel free to contact Phoenix EMS on 1300 0 PHOENIX or email sales@phoenixems.com.au.